Although lead was banned from oil-based paint in 1978, today's oil-based paints may still contain some heavy metals in the pigments. Oil-based paint contains potentially poisonous hydrocarbons, and high levels of volatile organic compounds, or VOCs, which perform numerous function in paint and evaporate as the paint dries. The most significant health effects of oil-based paint are due to polluted air from VOCs, inhalation and poisoning. Drugs.com defines oil-based paint poisoning as large amounts of paint getting into your stomach or lungs. Paint also can enter your system through your skin or eyes. The primary risk is from the hydrocarbons in the paint, and symptoms include respiratory difficulty or coughing, confusion, rapid heartbeat, skin irritation and blistering and irritated or watering eyes and sinuses. Consider possible oil-based paint poisoning a medical emergency and call a health-provider immediately. Be prepared to provide as much detail as possible about the affected person, as well as the exact material ingested or inhaled. The Environmental Protection Agency states that some VOCs are known to cause cancer in both animals and humans, while others have been insufficiently studied for their risk factors. Extent and length of duration probably influence the risk level--VOCs are not only found in oil-based paint, but in a wide range of common household products such as detergents and air fresheners. Today's water-based paints typically have very low--or even zero--VOC compared to oil-based paint. VOCs are measured in parts per gallon--latex paint typically has betwen zero and 50 parts per gallon, while oil-based paint is in the hundreds. The VOC level should be listed on the paint can label. The EPA cautions that exposure to oil-based paint may also cause organ and central nervous system damage, although it is unclear which compounds are most toxic, and what levels are considered harmful. Pregnant and nursing women should avoid using or inhaling oil-based paint. Some people may be particularly sensitive to oil-based paint and will feel dizzy or nauseated, have trouble breathing, develop a rash or have some other adverse reaction with very little exposure. Always work in a very well-ventilated area, opening windows and using fans to vent the room when working inside. 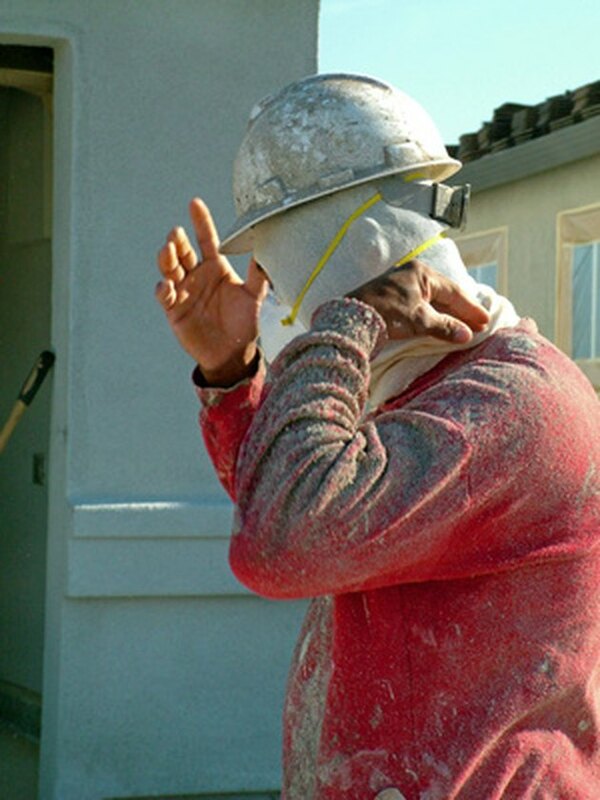 Wear a respirator while using oil-based paint, especially when spraying it. If you have a troubling reaction to the paint, discontinue use and check with your medical provider. Don't use oil-based paint if you or anyone in your home has allergies, or suspected allergies, to mold. Oil-based paint provides a nutritious environment for mold and mildew because mildew will feed on the oils in the paint.